I've thought a lot about what I really want to do with my blog. It's one of those things that I would LOVE to focus 100% of my time on, but unfortunately, it doesn't pay the bills (or pay anything at all to be honest with you). It's something I started mostly to just openly share personal stories about my life along with sharing passions that make me tick. I recently featured Jill Hatch of Sugarcane Hawaii for Issue No. 12 of my series In Good Company. She sparked an idea in me and basically is the reason for this post. FOOD and COOKING is an integral part of both our lives and I've blogged about it a lot on this very platform, sharing some personal faves as well as personal flops in the kitchen. You can find all my recipe posts here in case you're interested (and yes, I hope to post more). So, lets get to the point here. I'm venturing out a bit more to look for contributing content here and there when I feel the spark but mostly on the topics that inspire me as well as those which are a part of my every day. Jill Hatch is our FIRST food contributor who has graciously offered up one of her recipes (and one I can personally vouch for!). When I was in Hawaii this past March, she made these amazingly delicious flatbreads accompanied with homemade grapefruit cocktails. I basically felt everyone else needed to be in on this delicious meal. Mix juice, St. Germaine, vodka and ice in a cocktail shaker. Shake and strain into 2 glasses filled with ice. Top it off with your favourite Prosecco. Add garnish and serve. Making your own pizza crust is like mission impossible. At least for me it is. I've mastered some and failed at many attempts in my amateur cooking career. So when you find a no fail recipe that ALWAYS works, you stick with it. And lets be honest, store bought crust has NOTHING on a homemade one and that includes pastries, pie crusts you name it! Jill made us these amazing flatbreads one evening at her house and needless to say, I had to have the recipe. Now you all will! There really isn't any magic to it, just find the right combination of toppings you love and those you feel would compliment each other. Then watch the magic happen. (recipe adapted from The Pioneer Woman via California Pizza Kitchen). Put the yeast into the warm water and let stand for a few minutes. In a food processor or stand mixer bowl, measure out flour then add salt. Put the mixer on low, then add EVOO slowly. Make sure the EVOO is mixed in well. Then add the water/yeast mixture. Mix together until dough comes together and is formed. Cover the bowl and let stand (rise) for up to 2 hours. If you prefer a warm place to put this, I place it in my oven with the oven light on. It offers just the slightly warm environment the dough needs to rise. Fave BBQ sauce (can be homemade or store bought). Pour the BBQ sauce over chicken breast and let marinate for up to 30 minutes. THEN place it in the oven for approx 25 min at around 350 degrees. Remove the chicken and pour more BBQ sauce on, depending on how saucy you like it to be (the more the better!). Set the chicken aside while you prep the other ingredients. Slice the onion into 1/2 moon shapes (take out middle to achieve this), slice up mozzarella into thin pieces (1/8" thick pieces). Cut up the chicken into thin slices, then cut the other direction to form cubes. 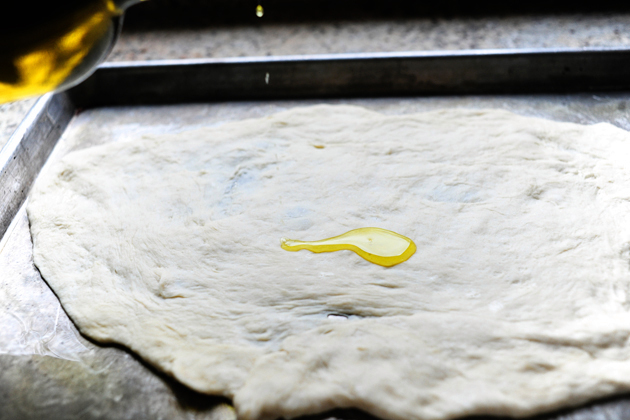 Pour a bit of EVOO onto a sheet pan and smear all over to cover the area of the pan. Grab 1/2 the pizza dough and form a nice, tight pulled ball then start to roll out dough onto pan surface (you can use a rolling pin, but for a flatbread, using hands will achieve the asymmetrical look). Drizzle and brush EVOO over bottom of dough, sprinkle lightly with salt and smear a small amount of the any leftover BBQ sauce you may have. Then, start piling on your ingredients in this order: mozza cheese, BBQ chicken, red onion. If you really want to go wild, drizzle more BBQ sauce on top. Bake in the oven for 15-17 min at 375 degree oven. Once its cooked, sprinkle over diced cilantro and Bob's your uncle! Enjoy!